With an effective online presence in the Catholic community, HolyLand-Gifts.com is committed to upholding its reputation for great selection of religious catholic items and a superior customer service. Our high quality products, such as our rosary necklaces, medals and cross necklaces, jewelry, rosaries, catholic music boxes, boat plaques, gift certificates and prayer tokens, speak for themselves and mark all auspicious occasions. We offer the most outstanding selection of beautiful hand-crafted ornaments lovingly carved by Christian artisans who use time-honored techniques to diligently shape all religious items to their perfection. Since centuries, Catholicism has been a part and parcel of the life of billions of Christians dwelling all corners of the world. We know how to honor the feelings of people proudly associated with the cult of Christianity. That is why we have a wide assortment of religious Catholic items elegantly designed and created by Bethlehem Christian artisans. All of our supplies are made of fine quality olive wood and ideally fit for home decor needs as well as wearing around neck. So, what are you waiting for? Get ready to give your religiousness and devotion a new height with our selective Catholic religious items that are priceless. 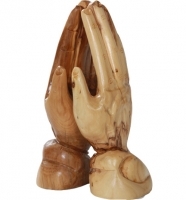 Holyland-gifts offers discount products the catholic religious items. Products including rosaries and rosary beads, cross Necklaces, and many more.